Unlike regular leads and ropes, this heavy-duty lead is super soft on your hands. It doesn t cause any irritation or discomfort. You can take your horse all around without any of the annoyance of holding rough rope or lead. Even though this lead is made of super soft cotton, it s still incredibly durable. Great for use after use, you ll never want another lead again. Through all of the walks, pulls, and unraveling, you ll be so impressed with the reliability of this rope. The brass trigger snap attaches easily to any halter or harness and stays attached. The classic trigger style allows you to easy remove the lead, but does not allow the lead to be pulled or wiggled off. You know your horse is always secure. For over 45 years, Intrepid International has been the leading global manufacturer and distributor of products for horse and rider. We strive to provide quality products at reasonable prices with superior customer service. 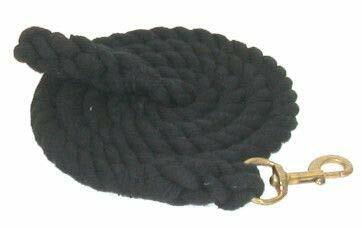 Package contains (1) Intrepid International Heavy Duty Cotton 10 Foot Lead Rope with Brass Snap. 0.75 x 10 . Braided back at both ends. Brass trigger snap. Soft, durable cotton construction. SOFT ON HANDS: Unlike regular leads and ropes, this heavy-duty lead is super soft on your hands. It doesn't cause any irritation or discomfort. You can take your horse all around without any of the annoyance of holding rough rope or lead. HEAVY DUTY CONSTRUCTION: Even though this lead is made of super soft cotton, it's still incredibly durable. Great for use after use, you'll never want another lead again. Through all of the walks, pulls, and unraveling, you'll be so impressed with the reliability of this rope. RELIABLE TRIGGER SNAP: The brass trigger snap attaches easily to any halter or harness and stays attached. The classic trigger style allows you to easy remove the lead, but does not allow the lead to be pulled or wiggled off. You know your horse is always secure. EVERYTHING BUT THE HORSE: For over 45 years, Intrepid International has been the leading global manufacturer and distributor of products for horse and rider. We strive to provide quality products at reasonable prices with superior customer service. 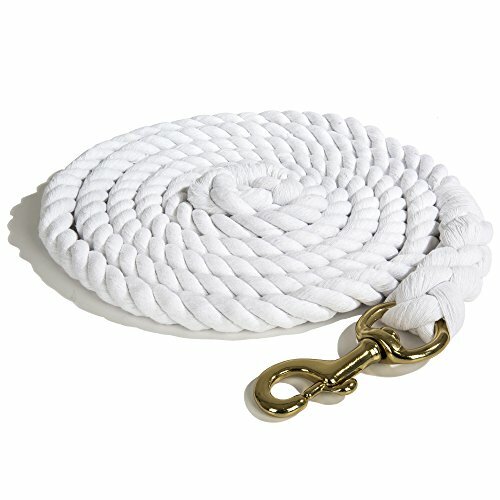 PRODUCT SPECIFICATIONS: Package contains (1) Intrepid International Heavy Duty Cotton 10 Foot Lead Rope with Brass Snap. 0.75 x 10'. Braided back at both ends. Brass trigger snap. Soft, durable cotton construction. 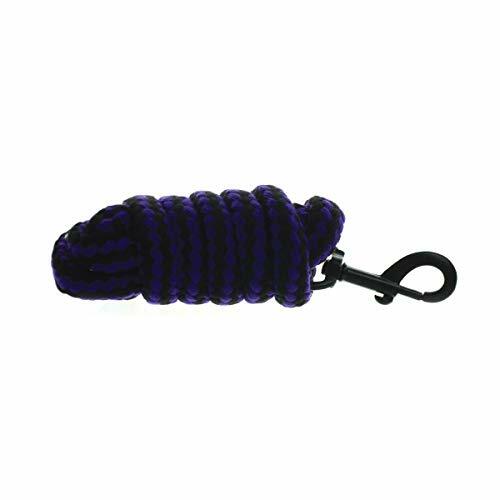 Heavy duty 5/8" round striped cotton lead rope is perfect for all your horse handling needs. Features a brass finish bolt snap with 10 feet of quality soft cotton. Ideal for ground work. Best Rated Product! 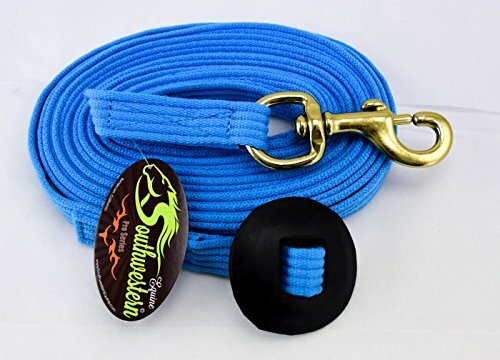 STURDY CONSTRUCTION - these lead ropes are made with high-quality braided cotton and brass plated, rust proof, sturdy metal snaps to guarantee your lead rope lasts for years to come. 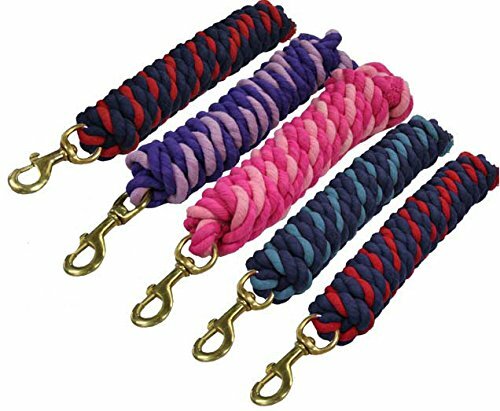 MULTIPLE COLORS AVAILABLE - our lead ropes are available in four attractive and fun colors: Purple/Lavender, Pink/Light Pink, Royal Blue/Light Blue, and Navy Blue/Red. RUST PROOF BRASS SNAPS - our lead ropes feature brass plated, rust proof snaps that are designed to hold up to heavy use for years to come without rusting or breaking. SOLID COTTON CONSTRUCTION - these lead ropes are made from soft and sturdy braided cotton, which provides a long lasting, sustainable, renewable, and eco-friendly choice! PERFECT FOR TRAINING - whether you're leading your horse or other animal (dog, goat, sheep, cow, etc.) around, or doing groundwork or training, these ropes are great due to their sturdy and safe construction. 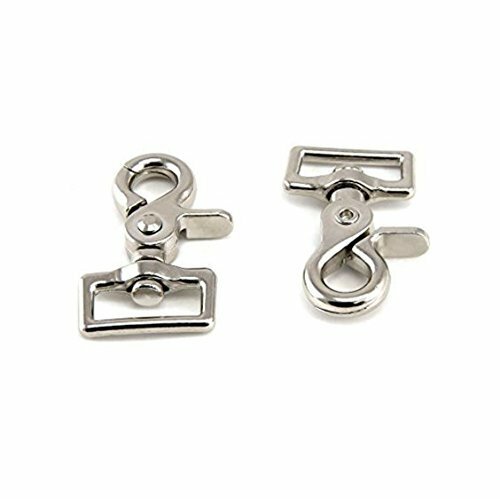 Set Of 2 Trigger Scissor Snaps With Swivel . Overall Length With Swivel Is 2 5/8" For Reins, Leashes, Tack, And Many Other Applications. Buy With Confidence From A Leader In The Tack And Hardware Industry, USA Owned And Operated. Original tough-1 3/4 inch braided cotton import lead equipped with chain for better leading. 8 1/2' in length. Brand: Tough 1 | Manufacturer: JT International, Inc.
Yacht rope leads are used by horse trainers world wide. Made in the USA with an eye spliced loop. A back spliced is done on the popper end for added weight. Double braid polyester has great abrasion resistant properties and is very strong. High quality product manufactured by the Knotty Girlz of CBKnot. Eye spliced loop one end, end splice and popper other end. 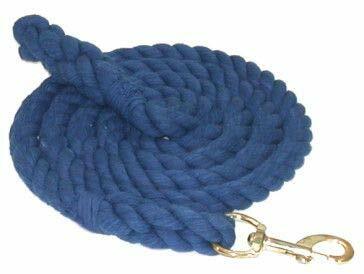 Easy to use and easy to wash.
Soft, yacht rope, great for training horses and training aid. Strong polyester rope holds up to the elements. Long Length 12ft. and 14ft. options. Good sunlight resistant, great abrasion resistant properties with little stretch. Manufactured in the USA (both rope and product). Made by the Knotty Girlz, manufacture to the trainers. Great training product for leading and working with horses. A must have for the natural horseman or women. 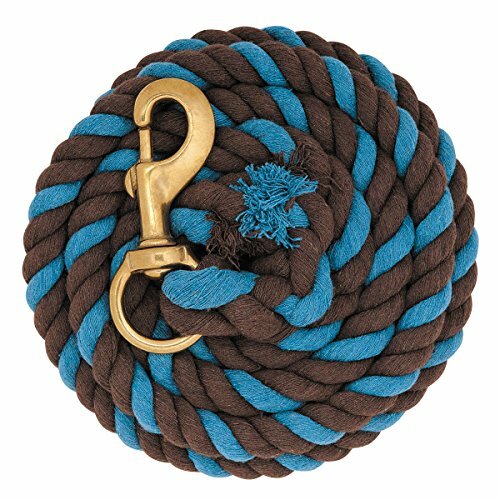 Constructed for quality and value, soft cotton lead rope in popular colors with a non-rust solid brass 225 snap. Measures 5/8 inch x 10'. Perri's Is Best Known For The Most Complete Line Of The Finest Amish Made Products Available Anywhere. 5/8" Polypropylene. Solid Brass Swivel Snap. 8' Long. These Are Very Sturdy And Super Soft On Your Hands. 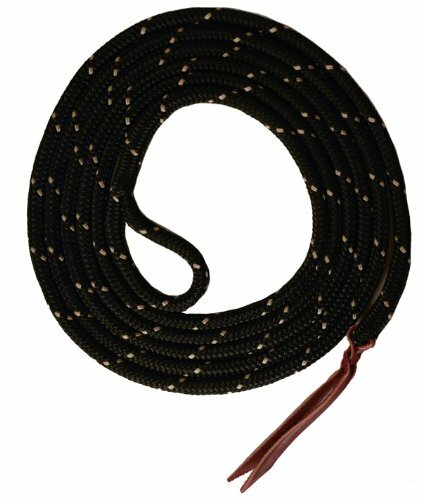 This 24 foot lunge line really is ready to help you get to the basics with any horse. Out at pasture or in the round pen, you can have the versatility of it all. 1" brass plated snap to keep strong and not bed under pressure. Made with a cotton webbing to stay soft, and comfortable in your hands. This will help prevent those pesky rope burns when your horse gets a little frisky. The rubber stop also helps when your horse is being over active, or when your starting a young one. The rubber stop helps keep the lunge line from totally running through your hands if your horse takes off, or pulls. Pick any of the fun colors that show off your style! COLORS - Fun colors for you to be able to choose to show off your style. COTTON - This cotton web lunge line is definitely much softer then most. Now you can lunge your horse in comfort and won't have to worry about getting those pesky rope burns. RUBBER STOP - Don't ever be faced with your horse getting a little frisky and flipping that rope out of your hand. 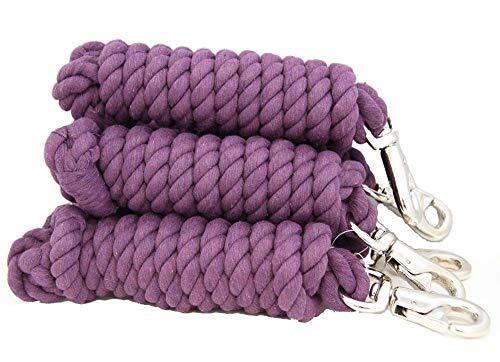 Our cotton lunge line has a rubber stop to help you have more grip and stop the rope from sliding all the way out of your hand. Cotton lead rope in attractive twin colors that match the Hy Duo Head Collars. Trigger clip. Cotton lead rope in attractive twin colors that match the Hy Duo Head Collars. Made by Gatsby, a reputable company that has been making quality goods for over 3 years, this is a cotton lead with snap. 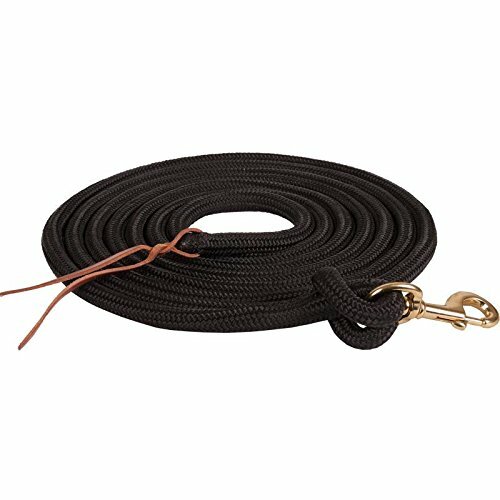 This great lead features: Soft easy to grip cotton rope lead measuring about 1 feet Thick interwoven end to help prevent fraying, making it easier to keep it from slipping out of your hands, as well Heavy-duty bolt snap, which is integrated into the lead for a clean durable finish This lead rope is great for use around the barn, as well as for many other places that you take your horse. Try it and see why more people are switching to quality Gatsby items for their horses. Lot of FIVE brand new 10' x 3 4" cotton lead ropes. Made with heavy duty cotton, chrome plated bull snap, braided end.